At Eclipse RV, Inc. we've taken a stance in the industry to create an innovative line of toy haulers, allowing you to enjoy the great outdoors like no other recreation vehicle in the industry. So no matter where you going, make sure you're livin' a Stellar Life! 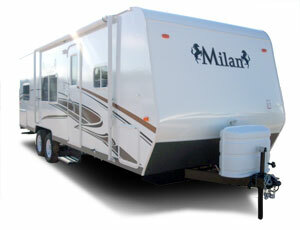 The Eclipse Milan has everything that you need to camp in style! This Fiberglass sided aluminum framed unit is priced the same as many aluminum and wood framed models. It is a great floor plan and has room for everyone and easily towable by 1/2 ton trucks or SUVs. 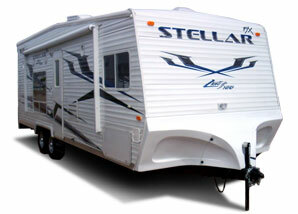 The beautiful decor is homelike and upscale for this type of trailer. Every room in a Sandpiper is meticulously and practically designed to make careful use of all of its space. A rich combination of woods and attractive fabrics, highlighted by professional details and domestic window treatments, give the Sandpiper a reputation of elegance and outstanding quality.